Among the diverse and extraordinary range of work exhibited at Liverpool’s Old Blind School, Marc Bauer’s painstaking detail and staggering use of scale certainly catches viewers’ attention. Bauer decided to immerse himself in a dingy hotel room in Liverpool, in an effort to become ‘part of the story of the place’. There is an evident sense of intimacy within his work, which gives an insight into distinct details within Bauer’s daily routine and habitual activity. Meticulous drawings based on scenes in his hotel room, combine to produce narratives which recount precise memories, something the artist is ‘interested in…because in a way it is a constant process; you are always inventing a story around every event you have experienced’. In a neighbouring room, an overwhelmingly vast charcoal valley scene extends across the whole side wall, and is not only striking in it’s dynamic, powerful use of the medium, but also in it’s ability to transport the viewer into the bleak, windswept landscape itself. The impressive use of charcoal suggests Turner-like scenes and emphasises the extreme violence of nature which encompasses the fragile, isolated figures in the centre of the artwork. Based on old family albums and archives, the charcoal expanse reveals an aspect of the Bauer’s history and background, providing another platform for understanding between the artist and the viewer. We are not viewing, what might seem at first insignificant details surrounding the artist, but rather an invitation to engage with Bauer’s past and present. Ella Breese, Fine Art student. 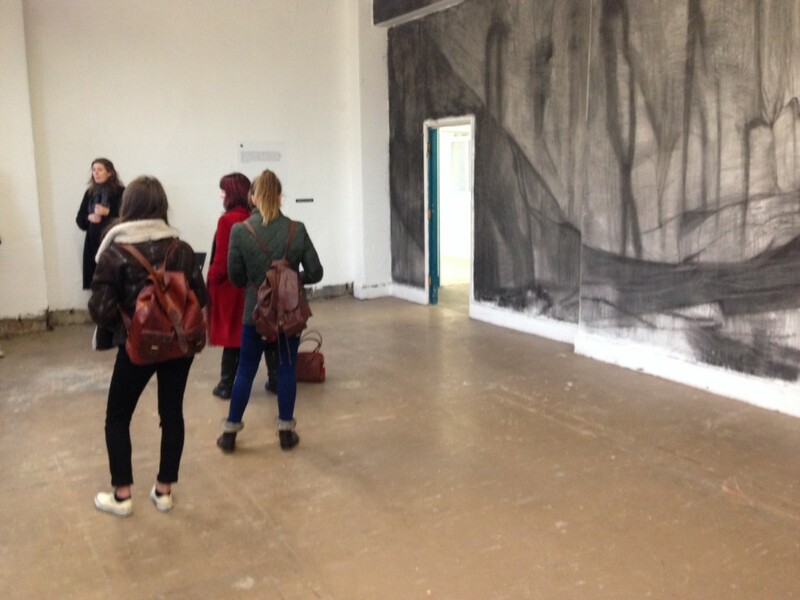 Photograph:Vanessa Boni, Liverpool Biennial Public Programmes Curator, discusses the exhibition at The Old Blind School.